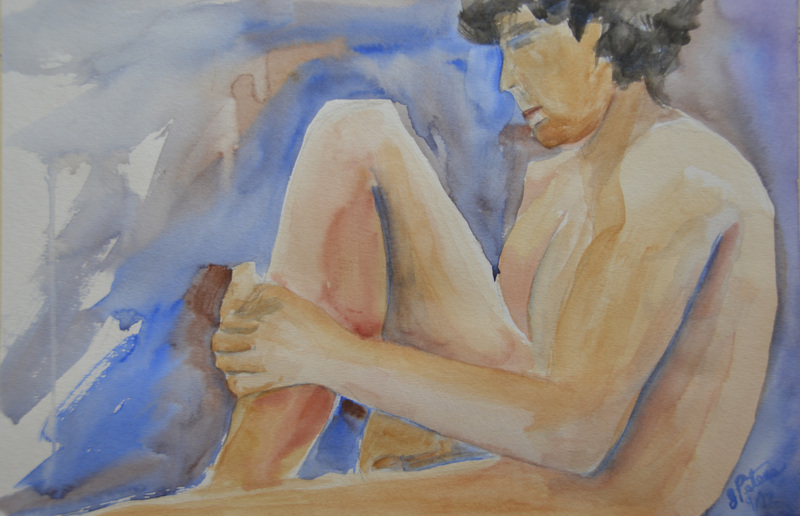 This past Tuesday night, I worked in watercolor at the life drawing session. I did get a bit frustrated as I attempted to work in bolder colors. What I have finally figured out is that a 20 minute pose just isn’t long enough for me as I work at building the layers and therefore the intensity of the colors. What I did figure out is that this week I am not going to work in watercolor, I think I will go back to pastels/charcoal and see what I can make happen. 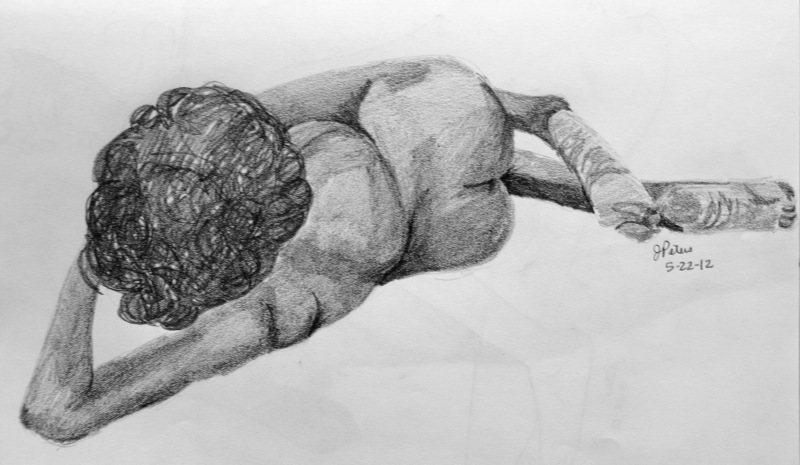 This past Tuesday evening I did go to my life drawing session. Craig was our model; he always takes the most unusual poses. These drawings represent three different 20-minute poses. I worked in graphite pencil in my 11″x14″ sketchbook. I have two more drawings that I started, but I want to come back in and add some more value to them before I post photos. I will try to finish those drawings today, since it is Saturday. 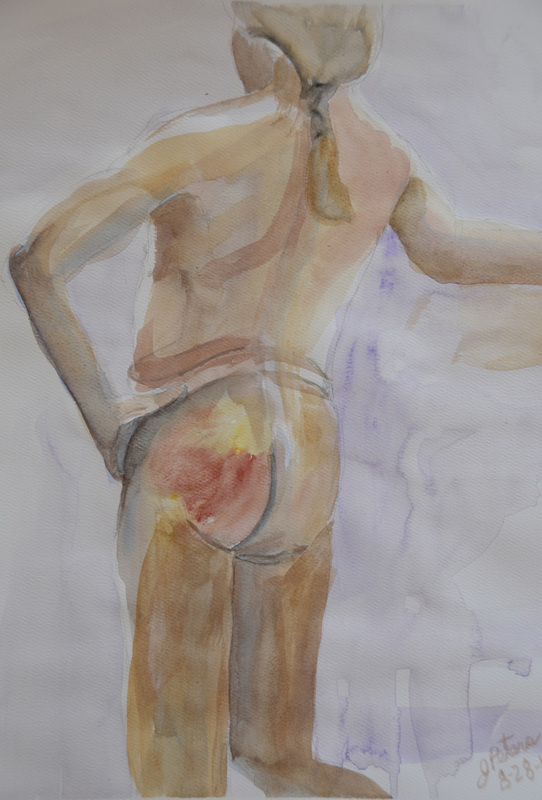 This past Tuesday night, at my life drawing session, I decided that I was going to work in watercolor. I wanted to work more loosely than is typical for me. To make this happen, I did not sketch the pose in pencil first, instead I focused on painting the shadow/darker areas of her form. Because our model, Lisa, had short black hair, I also found it helpful to paint in the mass that was her hair. From there, I would add in the various values and tones to complete the figure. 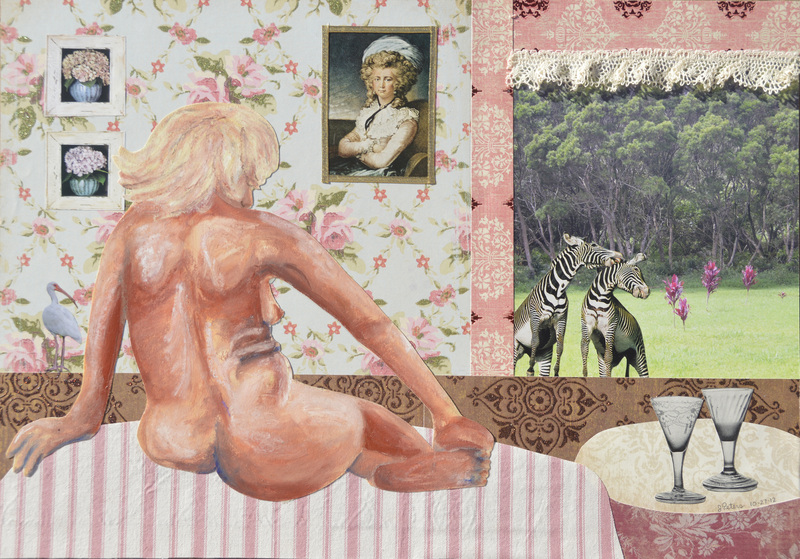 Each of the paintings was accomplished during the 20-minute pose. Last night was Life Drawing at Stu’s studio. We had a new model, Vanessa. 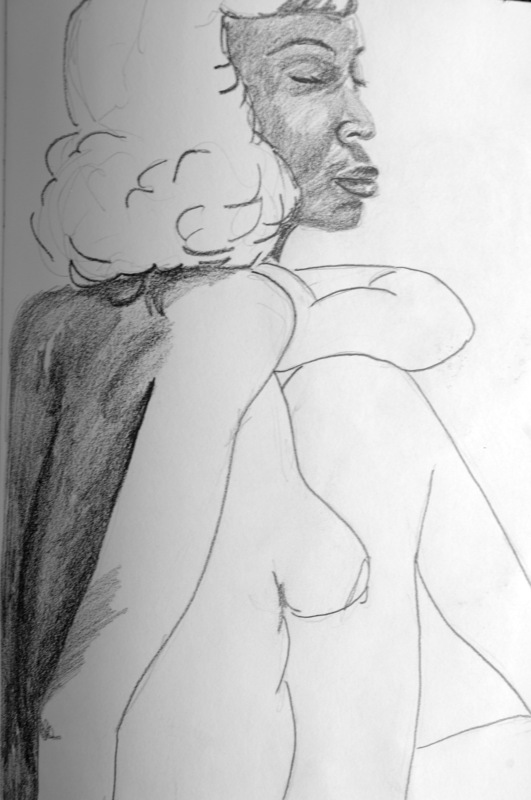 She was a fairly young, thin, African American model with curly black hair that was hard to capture. It was very refreshing to have a model that was different from our norm. 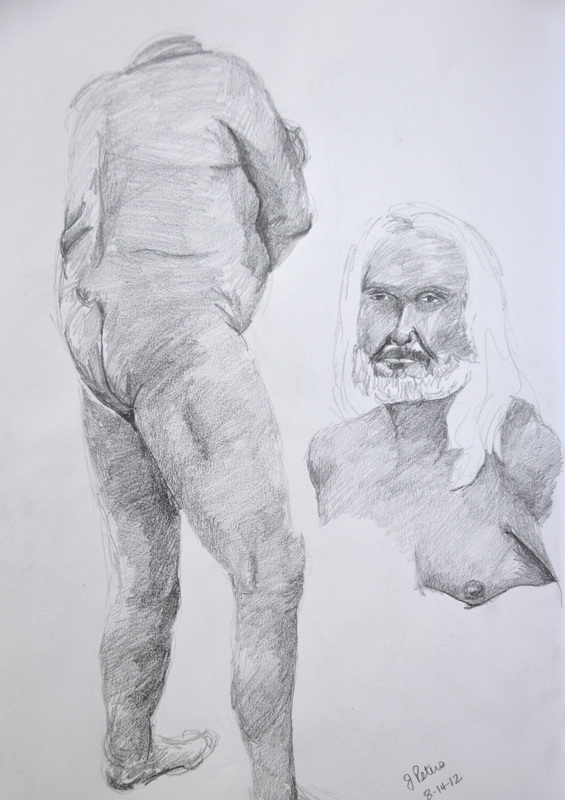 I worked in my 11″ x 14″ sketchbook, with graphite pencil, and focused on achieving correct proportions first, then with the time remaining in each 20-minute pose, I added value. I was surprised that I was able to accomplish so much in a short pose. I finished the night with what I felt like were 4 decent drawings. 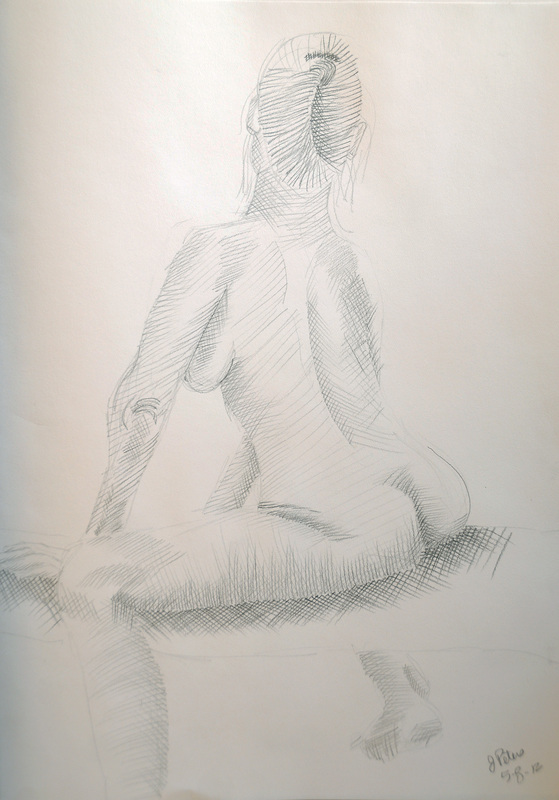 This past Tuesday was another life drawing session at Stu’s studio. Because I did not want to continue working in soft pastels, I decided to simply use graphite pencil and draw in my 11″ x 14″ sketchbook. I am now on page 175 out of 185 in my sketchbook! This particular book is one I use only for figure drawing; it was begun in March of 2011 and I am about to have it filled up. This is quite a feat for me as I have many sketchbooks, for different purposes, but this is the closest I have come to actually filling every page in a single sketchbook! 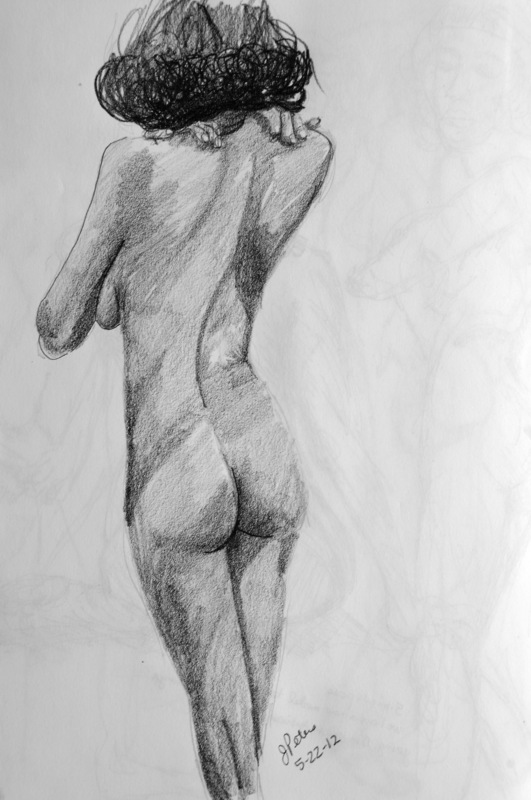 I decided to go back to basic drawing with graphite pencil in order to focus on both proportions and value. My first drawing of the night was the larger drawing seen on this sketchbook page. While I usually work my values gradually and gently,I began the night feeling a bit anxious and decided to try and loosen up with rougher marks. I also tried to delineate the figure with adding darker graphite marks in the negative space. For the second 20-minute pose, I decided to work on a portrait of Teresa in the open area of the page. Now I was able to relax and applied the values in a smoother mode. This page is a fairly accurate representation of Teresa. I was calm and relaxed as the night progressed. 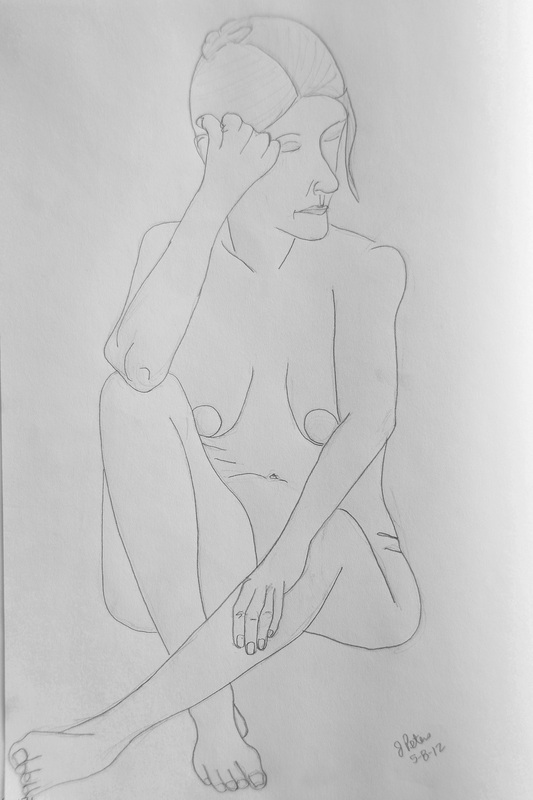 The contour line drawing of Teresa was begun with light pencil marks that were a bit rough. I was pleased with the contour that I drew, so I went back over and darkened the lines. This drawing might be a starting point for a painting or print in the future. My last drawing of the night was this drawing of Teresa where I worked the values in hatched and cross-hatched lines. I can see this drawing as my next drypoint! I do feel as if the night’s focus on proportion forced me to really look closely at the model. 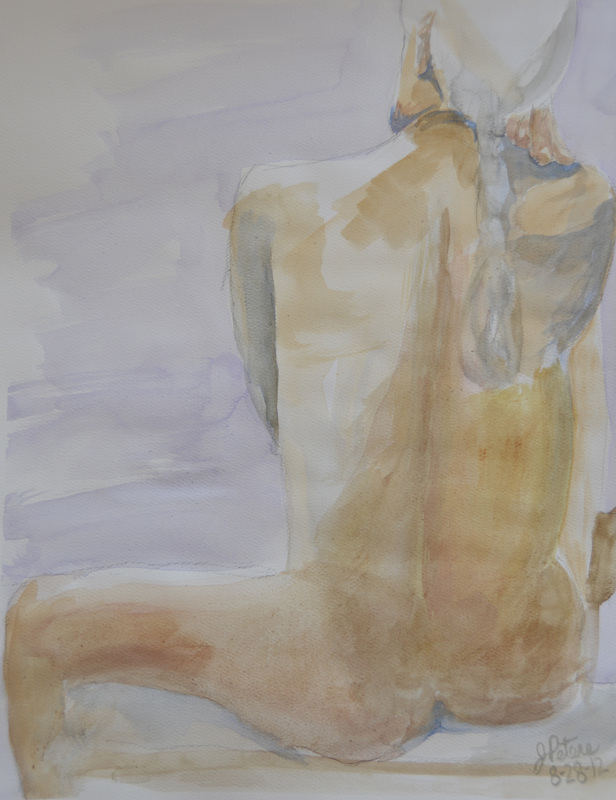 I think I will do something similar to this at the next life drawing session!